Water droplets from Cascade Creek ride an aspen leaf down stream as fall colors adorn the banks and mountainsides of the San Juan national Forest. 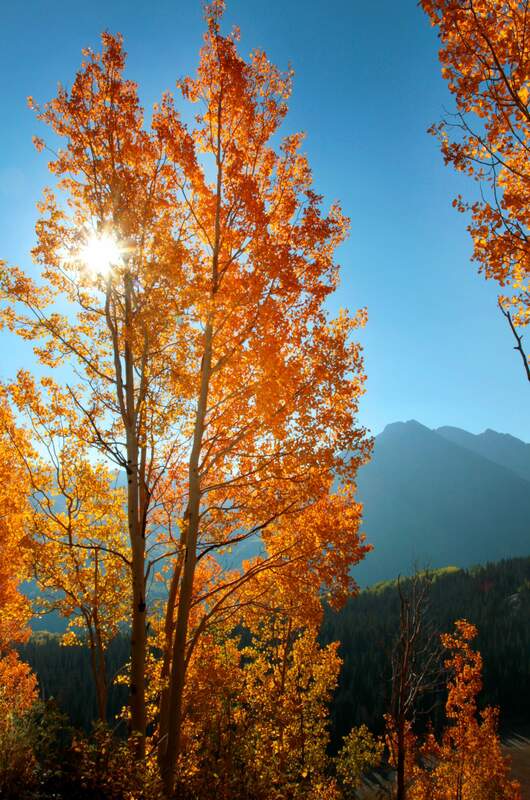 SHAUN STANLEY/Durango Herald - DURANGO - 09/18/2012 - The morning sun peek through the branches of Quaking Aspen along U.S. 550 between Coal Bank and Molas Pass with Twilght Peak on the horizon. 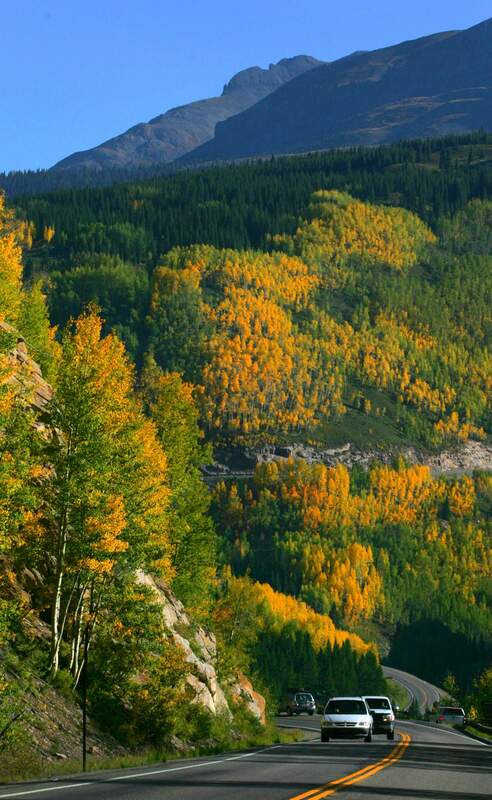 SHAUN STANLEY/Durango Herald - DURANGO - 09/18/2012 - U.S. Highway 550 between Durango and Silverton will be a popular route once again this fall for people wishing to see the fall colors within the San Juan National Forest. 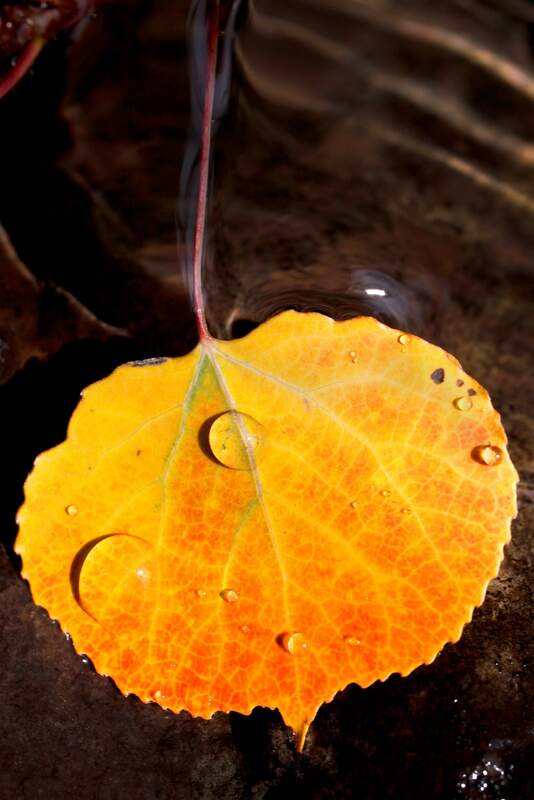 SHAUN STANLEY/Durango Herald - DURANGO - 09/19/2012 - The beauty is in the details within the San Juan National Forest on the mountainside above Lime Creek Wednesday as demonstrated in this flash illuminated aspen leaf. Late afternoon sunlight reflect off thewaters of Cascade Creek saturating the fall colors of an aspen tree along the banks. Fall colors are reflected in a car window parked at a pullout along U.S. Highway 550 near Molas Pass Wednesday. A bus winds along U.S. Highway 550 between Coal Bank Pass and Molas Pass Tuesdays as fall colors begin to show along the mountainsides of the San Juan National Forest. Aspen leaves sway in a cool afternoon breeze signaling the changing of the season on the high country outside of Durango. Quaking Aspen ablaze in colors just off of U.S. 550 between Coal Bank and Molas Pass with Twilght Peak on the horizon. Morning sunlight illuminates a stand of aspen tress starting to turn their fall colors with the San Juan National Forest. A macro view of an aspen leaf displaying it's fall colors before falling to the ground in the Lime Creek area of the San Juan National Forest. The leaves of aspen trees display their range of color backlighted by the afternoon sun along Cascade Creek north of Durango. Fallen leaves create a mosaic of colors and textures on the ground of the San Juan National Forest near Andrews Lake off of U.S.Highway 550. The high country explodes in fall colors. Don;t wait to see natures annual show. Fall color followers can get an eyeful in the high country this weekend as aspen and scrub oak turn from green to yellow to orange to brown to rust to red. It looks like the best viewing will be between Durango and Ouray, said Mark Winkworth, the visitor information guru at the San Juan Public Lands Center and the keeper of the U.S. Forest Services Fall Color Report website. Winkworth updates the website  www.fs.usda.gov/sanjuan, click on quick link to fall color report 2012  as often as possible. A little further into next week, Purgatory, Telluride and the Dallas Divide will be coming on, Winkworth said. Telluride and the Dallas Divide were 40 to 50 percent in color this week. Purgatory is lagging at 30 percent, but should be looking good soon, he said. The last weekend of the month should see beautiful colors around Purgatory and Pagosa Springs and Wolf Creek Pass to the east. Change of color is only one facet of leaf study this fall for students in two classes taught by Professor Heidi Steltzer in the biology department at Fort Lewis College. Two or three times a week, they check foliage on campus to note color change and the date leaves have fallen. Leaves appear green in spring and summer because they absorb the red and blue light of the spectrum but reflect the green, Steltzer said. In the fall, when the chlorophyll breaks down and the molecule that reflects green is no longer there, the eye sees the other pigments, Steltzer said. She said its possible that drought conditions have robbed foliage of some of its vivid colors this year. Winkworth does reconnaissance as well as gather tree-color reports from Forest Service employees around the region. Aspen dominate the landscape in the high country, but in Durango and the Dolores/Rico area, its scrub oak that is most attention-grabbing. The Alpine Loop around Lake City is usually the first to change color, Winkworth said. Circling the San Juan Skyway  Durango, Silverton, Ouray, Telluride, Dolores and back  is a long drive but is bound to be rewarding, Winkworth said. You should see some nice color there for sure, he said. Anyone who misses the high country show can visit lower-lying river valleys to see what cottonwoods have to offer, Winkworth said. Therell be color around Navajo Lake, along the state line toward Arboles and then into Pagosa Springs from the south, Winkworth said. The change of season as recorded by the kaleidoscope of arboreal color could last beyond next weekend, although long-range forecasting involves a lot of guesswork, Winkworth said. U.S. Highway 550 between Durango and Silverton will be a popular route once again this fall for people wishing to see trees changing in the San Juan National Forest. Today is the autumnal equinox  the official start of fall. Most aspen have turned around Silverton, but the foliage near Purgatory ski area is still turning. Public lands officials recommend to head high to see colors this weekend.